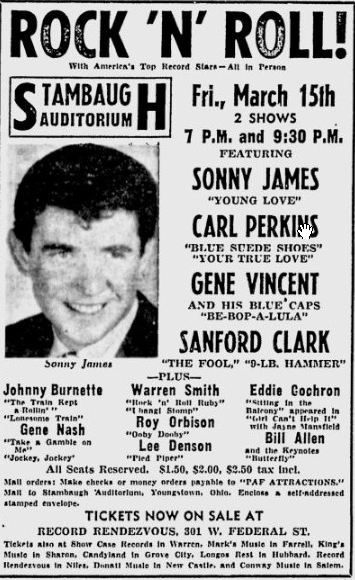 There was a time in the late ’50s when country-fried rockabilly and rock ‘n’ roll were pretty much in mutual agreement and a fine example of this is the show with headliners Sanford Clark, Gene Vincent, Carl Perkins and Sonny James on March 15, 1957 at the Stambaugh Auditorium. The bill also included a young Eddie Cochran and Roy Orbison. At $2.50 for top tier tickets, it seems like the price was quite the bargain.